Here is a conversion I am doing for a customer. The guitar has had a refin to all gold. Lots of great things ahead so let's get started. What a great find! The top is booked matched and 3/4" off center. This will make a great plain top Burst. OK on the down side. This is why I don't like to buy all gold refins. There is a 1/16" shim in the neck pocket. And about 1/16" of wood filler in the neck joint and the body has been sanded way out of profile. I'll deal with these 2 issues later. First I'll steam the neck out. I pull out 4 frets and bore 8 small holes into the neck pocket for my needle. The neck pops right out with a little pressure from my jig. Here is another issue. You can see there are bit marks into the neck pockets bottom and sidewalls. These can all be fixed but I'm wondering if the neck is original to the body? Either way it will make a great old LP when the project is completed. +1!!! Go, Jim, Go! Great project, and great candidate! Wherever I go, there I yam. Evidence is pointing toward a non-original neck. Jim, the neck may be an original neck that was reset in that body, that would explain the lack of fit and the filler on the top side of the neck. The mortise on the guitar is not kosher, drill marks and all. I especially like the bottom of the neck, is very telling in why it was removed so easy! Thanks everyone. Even with the few anomolies I think the guitar will be a great player. I'm sure the neck is an original 50's neck but probably not the original neck to the body. The lack of glue is why it came out in about 3 minutes. Next up is to clean the original pickup routes so my plugs have fresh wood to bond to. I use a 1/2" router bit and enlarge the pickup cavities by 1/64". I cut the mahogany/maple plugs and use a 1/4" radius bit to round the corners. This will make a perfect fit. Plugs made, dry fit and ready to glue into the body. Plugs sanded and ready to move on. Great job matching up the grain lines. The plugs are one of the best fitting I have seen. Thanks for sharing. Last edited by MapleFlame; 10-10-11 at 07:04 PM. Really cool to see the process, thanks! And a thanks from down under too...keep up the pics please! 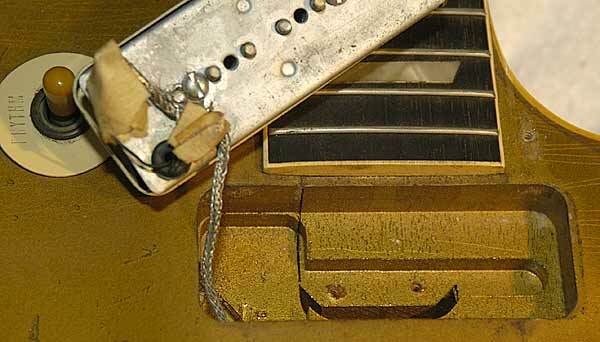 Thanks Steve, it took me 3 hours to find the plug for the bridge cavity. I went thru a lot of maple to find a piece that would match the tops grain lines. It's not perfect but a good match IMOP. And to think 90% of it will be routed away...that's a professional approach. Well done. Great work, keep the pictures coming! I do each project as if I were doing it for myself and that's how I would want the job done. Next up I cleaned up the bottom of the mortise and added a piece of mahogany. When I route the new 4 degree neck angle this will make certain the neck has a solid bottom to glue to. I also heated the binding and pulled it back for the next step. I want the new neck angle to be 4 degrees so I use a jig and a digital level to get the correct angle. I use a router and take 3/32" off the body thickness to get the 4 new degree body angle. I tape off the binding to make sure it doesn't get damaged. Now the body has a perfect 4 degree neck angle. great progress pics and very informing. don't know if it's a '50s neck or not, but the FB looks like it is. Any chance of a headstock face photo boogieongtr? Again, thanks for taking the time post this. That bridge plug is frikkin unbelievable! Almost too bad it will be routed. 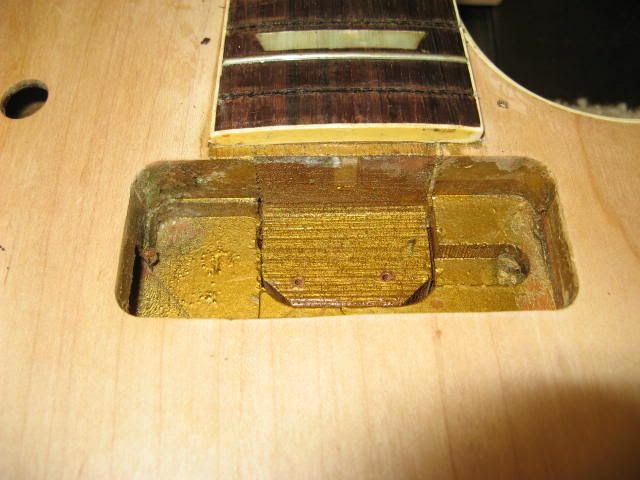 I use LMI luthiers glue that dries crystal hard like hide glue for the repair. Repair made to neck tenon. I need to change the 1952 neck angle of 2.8 to a burst angle of 4 degrees. I use the angle of my 1960 burst as my guideline. Here is a jig I made so I can use a small router and a straight cut pattern bit. Here is the neck fit right from my jigs. I'll do a final fit later. A perfect 4 degree burst angle. I use a similar 4* jig too. Thanks for sharing! Last edited by Joe Desperado; 10-13-11 at 08:46 AM. Awesome work --- thanks for the pictures - this is one of the reasons I love this place so much !! There is no such thing as too much flame !!! I use the angle of my 1960 burst as my guideline. Just love to watch these threads unfold. Thanks for posting. For the final fit of the neck I use a 2 step process. Step one, sand the neck with 100 grit sand paper glued to a piece of maple. I'll also do a few repairs to the body. The end of the body was sanded way out of profile. I glued a piece of mahogany to the body. I used a piece of flat grain mahogany to the end grain of the body for a good bond. And for my trademark. I use a mahogany plug where the 3 holes from the old trap tailpiece. I want to make sure the radius on the back of the body is even so I use a 3/16" radius bit and touch it up. Roger that. And utilizing custom jigs, tools, and pieces of quality "filler" wood elevates this project to the expert level. I commend your professional woodworking skills and talent that enables you to pull off a restoration project like this. Simply amazing. I can't wait to hear a final tone report on the finished guitar. Incredible work & documentation, Boogie! Are you a pattern maker? Your jigs & tools combined with your thoughtful approach are first rate! No, but after 28 years of woodworking you learn a few things along the way. Next up I'll glue the neck in using hot hide glue and a clamping jig I made. The jig allows me to apply pressure to the end of the neck into the mortise as well as downward pressure to the neck into the mortise. I also use 6 degree shims under my clamps that apply pressure into the neck mortise. IMOP this is the most important joint of a LP so I go to great lengths to get a perfect fit and great glue job. I've seen you do the tailpiece square plug previously and was, and still am, curious as to why you chose to not use circular dowels in each individual hole? Very nice Jim. Great detail used to show the clamping process. Where did you get the block that you mortised into the end to cover the ground channel? Just amazing work and care! I started doing this on my conversions and offered to my customers as an option. IMOP I like the square plug instead of 3 dowels. From so mahogany I got in the 80's.